It's only fair that I state up front that I am almost 35 years into my Michigan fandom. Obsession, really. I trust myself to be objective here, but I am also picking Michigan to win the game handily. It is up to you to judge the validity of that opinion - and you should have the full information available to do so. So, Go Blue, and let's move on. Like so many bowl games every year, this one features two teams that aren't quite where they want to be. There is no shame in the Orange Bowl, but both of these teams started the season planning on a playoff berth. For Michigan it was the loss to Iowa that sunk their dreams - they could probably have lost to Ohio State like they did and still made it if that was their first loss. Florida State had three losses, which was at least two too many. Really, though, their postseason dreams all but died way back on Sept. 17 when they lost to Louisville by 43. Hard to regain credibility after that. So, this game is a consolation prize for both teams, but it is far from a dud. You pretty much can't have a dud of a game when two iconic programs meet in a bowl. So, let's get right down to it. Why is this game not going to be particularly close in my eyes? Defense. First, Florida State. The Seminoles have improved defensively down the stretch (albeit against weaker offensive teams, so things are a little skewed), but they still struggle to be any better than average. They are particularly challenged against the pass. 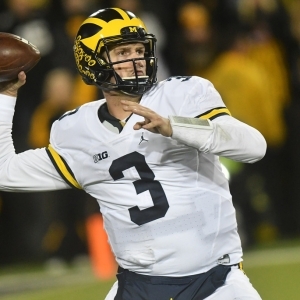 Michigan has a top tight end, solid receivers, and QB Wilton Speight should be healthy again after dealing with a shoulder injury that limited him in the Ohio State game. They are going to be able to exploit this secondary and score some points, and the extra time to prepare for this game means that we are sure to see some extra creativity unleashed. Florida State has an issue in this matchup. And then there is Michigan. This Wolverines defense is the best one outside of Alabama, and it will give Florida State issues. Michigan is second in the country against the pass, and their secondary is close to impenetrable. Against a freshman QB they are going to create issues. Michigan is also Top 15 against the run, so Florida State can't afford to bank entirely on Dalvin Cook dominating the game. Cook will be able to find room to move outside from time to time - it's Michigan's biggest vulnerability - but in general he will struggle to find room. This defense schemes so well, and with the extra time to get ready they are going to throw things at Florida State that they haven't seen this year and they are going to be in trouble. The defensive disparity in this one is so significant that it singularly defines the game in my eyes. The biggest benefit Florida State has coming into this one is the time. They have dealt with a lot of injuries this year, and this time off will give them some time to heal. Most significantly, Derwin James, one of the best defensive players on the team last year, was lost to a meniscus injury early this year, but he is hinting that he could return here. The more tools they can have on defense the better. This game is part of an interesting double feature in bowls. We see the second-best team in the Big Ten against the second- or third-best in the ACC here, and the next day we will see the best of each conference meet in the playoff semifinal. How this game plays out could give us a strong sense of what to expect the next day. The game opened widely with Michigan favored by 6.5, and that has since drifted up t o the key number of seven. Bets have essentially been split between the squads, so without an injury we aren't likely to see a big shift in this number. The total opened at 56.5 and has since fallen to 52.5. The Wolverines are 4-1 ATS in their last five nonconference games and 7-2 ATS in their last nine games following a straight up loss. They have gone "over" the total in 16 of their last 21 games overall and seven of their last nine bowl games. The Seminoles are 5-1 ATS in their last six nonconference games but just 1-5 ATS in their last six neutral-site games. They have gone "under" in six of their last eight overall and five of their last six bowl games. I opened with what I think, and it hasn't changed in writing it up. In defensive strength, experience, and hunger, Michigan has a big edge, and giving up just a touchdown is comfortable in this spot. I'd give up to 10 points without too much worry. Are you ready for some football winners? Doc's Sports has you covered! We are offering new clients $60 in free picks - these are actually members' picks from expert handicappers who live, breathe and eat college football and have years of successful betting/handicapping experience. Click here for the no-hassle sign up page (no credit card required).